Conservatives in VA: Wake Up | Virginia Right! There are some disturbing numbers being reported on the Public Police Polling website today. Just 4 short months after Republicans in Virginia ousted 3 incumbent democrats congressmen Obama is consider STRONG in Virgina. Obama leads Mitt Romney by 6 points in the state at 48-42. That’s identical to the size of his victory over John McCain in 2008. After that his leads increase to 8 points over Mike Huckabee at 51-43, 12 over Newt Gingrich at 51-39, and a whooping 19 over Sarah Palin at 54-35. 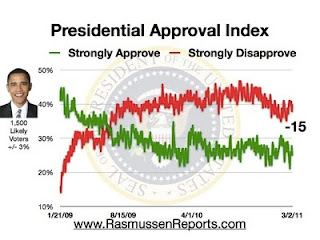 Additionally, while Rasmussen is reporting that nationally Presidential Approval Rating is -15%. President Obama’s approval rating in Virginia is at 48%. If that is not scary enough, remember, we also have a U.S. Senate seat up for grabs. The good news is we will no longer have to deal with Senator Webb, but the bad new is Larry Sabato has predicted that if Obama wins Virginia who ever the “un-named” democrat nominee will take the senate seat. I also believe this to be true. “The people that are sitting around saying, ‘He’s definitely going to be a one-term president. It’s going to be easy to take him out,’ they’re obviously political illiterates – political idiots, let me be blunt,” said former Arkansas Gov. Mike Huckabee in an interview. OUCH! O.k. I am wake and I get the point. This is no time to start resting on our butts assuming that Obama will be defeated, especially in VA. It is imperative that we turn Virgina back to red. As with a lot of PPP Polls, the outcome is suspect. This is a Democratic polling group that is the official polling outfit of the ultra liberal DailyKOS. This is a VERY small sample size – only 524, and I would guess they threw out a lot of conservative answers looking for a mix that would give them 50% of the respondents who voted for Obama in 2008. And any time you have a poll where one side has a single candidate and the other side has a number of potential candidates (none have declared yet), you find people who like one and dislike others. There are a lot of people who dislike Romney and would say they would vote for Obama rather than Romney because they hope their candidate would do better if that were the results. No, the only things this poll accurately shows is that while Obama’s support among African American’s remains strong, it is slipping from 2008. They also oversampled the black community. The 2007 census estimates that blacks constitute 19% of the population in Va and the poll sampled 20% blacks (105 out of 524). More blacks will stay home in 2012 and there is no way 20% of the voters in Va were black in 2008 (even with the very high turnout), or will be black in 2012. It also shows that the top tier candidates on the Republican side are really weak. If a RINO Republican – Romney – is the best we have to offer, we will probably lose. Gingrich is past his expiration date, Huck is a joke and a really BAD bass player, Palin is too polarizing AND too inexperienced. In 2012, OBama will have 4 years as President added to his experience. Hopefully, a strong second tier candidate will emerge. If Pawlenty can learn some charisma he might be a good option. And choosing a strong conservative African-American like West or Caine would most likely see a huge Republican victory in 2012. (Especially Col. West!). The point is this poll is out there and was widely reported yesterday on several news shows, including WRVA’s half hour news breaks. It promotes the perception to the general public that Obama is really not doing that bad of job and that Virginia, despite being solid red during the last two elections cycles, is still a swing state. Most Republicans and Conservatives know better, but we can not rely on Obama’s failures. I totally agree, the current slate of Republican Candidates leaves much to be desired. That will also play a role in whether Obama wins Virginia. We need to get off of our duffs and find a strong candidate and SOON!